Former McCormick staff member Jim Hahn received an early Veteran’s Day surprise this week when he was presented with a World War II medal that he earned but never received. Hahn joined the Department of Materials Science and Engineering machine shop in the 1950s when the department was forming as the first of its kind in the nation. Hahn, now 85, still comes to the shop to work with students and over the years has spoken with Mark Seniw, manager of the Central Laboratory for Materials Mechanical Properties (CLAMMP), about his World War II experiences. 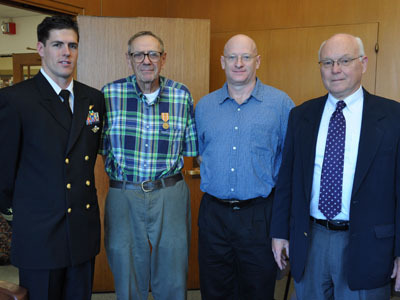 Seniw recently found out that Hahn never received his Asiatic-Pacific Campaign medal and arranged for the medal to be presented to Hahn by Lt. Anthony Arendt, an assistant professor of naval science at Northwestern’s ROTC program. The ceremony took place in the office of Stephen Carr, associate dean of undergraduate engineering. 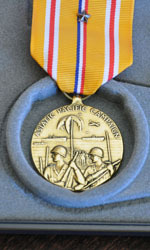 “On behalf of the late President Franklin D. Roosevelt and the people of a grateful nation, I present to you this Asiatic-Pacific Campaign Medal with campaign star in recognition of your service during the Okinawa Gunto operation March 17 – June 30, 1945 as a member of the 139th Naval Construction Battalion,” Arendt said. Hahn was humble about his service. Click here to read a Daily Herald article on presentation.